Marvel Nemesis features a dozen classic heroes like Spiderman and Daredevil fighting against a group called the Imperfects on the streets of New York. 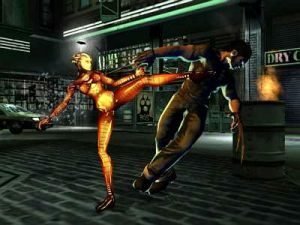 The game's fighting system allows you to use objects such as street lamps as weapons. From a design standpoint, the game looks solid with lush environments and beautifully designed worlds. The controls are decent and the characters move solidly. However, the AI makes fighting a bit mindless, and the cheap attacks hurt the game's appeal. Add a confusing structure gives the game a gimmicky feel that hurts its longevity. Overall, Marvel Nemesis has some good ideas that are poorly implemented, leading to what is ultimately, a disappointing experience that falls short of expectations. Marvel Nemesis: Rise of the Imperfects for the Xbox is the result of EA and Marvel's much-publicized deal to create a crossover title last year. The game itself has ended up as a mixed bag with some promising elements and cool ideas that have, unfortunately been subsumed by some poor design choices. This straightforward beat-em-up features a large cast of classic Marvel characters battling it out against an army of super-villains known as the Imperfects. The game offers both a single player solo mode and an internet-enabled mode playable on Xbox Live. Marvel Nemesis' roster is impressive and offers roughly a dozen unique characters, along with some variations of the same characters. There are 'good' and 'evil' versions of the same characters. There are hundreds of rewards including unlockable extras that become available later on, which should keep you motivated in the single player game. Some of these are minor, like new costumes, while others are more worthwhile such as additional characters, interactive comics, and movies. As you'd expect, the primary goal in each arena is to defeat your opponent. To that end, it's no surprise that each character in Marvel Nemesis has their own powers and unique attacks. For example, you can slice at an enemy with Wolverine's claws at close range or use Spider-man's web slinging ability to take down a foe. 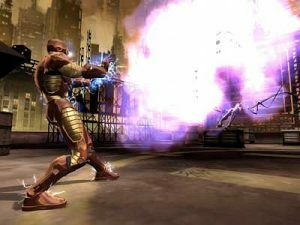 Other characters bring their own moves, with Iron Man and Silver Surfer both implementing effective flying and jumping moves that can be used to get out of range of enemy attacks. 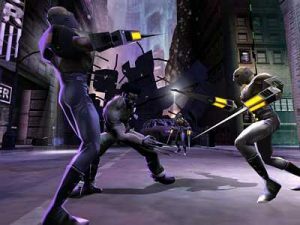 Marvel Nemesis allows players to perform Elektra's famous double blades, The Thing's raw power, Magneto's psychic abilities, Venom's sadistic moves and Daredevil's mix of stealth and danger. They'll need these super-powers since their superhuman adversaries are equipped with incredible abilities. Since the Imperfects were designed to be the unstoppable soldiers of an alien invasion, each of the Imperfects can take on these superheroes and match them shot for shot in terms of their raw power and intelligence. From an interface standpoint, Marvel Nemesis does an excellent job in creating an accessible fighting game. Controlling the characters using their special moves and attacks is surprisingly easy thanks to the intuitive, simplified control scheme. Most actions such as attacking, blocking and grabbing are require only a simple button press to complete. This makes the game easy to get into, and the shallow learning curve makes this an accessible game that should attract those put off by more complicated fighters. The downside of this approach quickly becomes apparent. The biggest problem with the game is that most of the battles are over very quickly, with most of the emphasis on throwing or using objects to cause the most damage. This reduces the importance of traditional fighting moves such as fighting and kicking while emphasizing Nemesis' reliance on projectile attacks. It definitely hurts the overall feel of the game, since even small objects can cause quite a bit of damage. So while the controls are excellent in their own right, they're undermined by poorly balanced gameplay mechanics that throws off the flow and strategy making for a frustrating fighting game that's poorly paced. Unfortunately, these unbalanced matches make things less challenging and reduces the strategy to mostly mindless button mashing. The gameplay itself suffers dramatically in the long haul, since you can essentially reduce much of the challenge to mindless button mashing, or make it a race between characters to see who gets to the objects first. Marvel Nemesis' structure doesn't do any favors for the game, either. In the single player mode, you face a seemingly endless number of mini-missions to complete. Since you are required to fight waves of foes repeatedly in order to progress through the storyline in single player mode, it makes this mode become repetitive in a hurry. The developers have tried to mix things up with different objectives, such as smashing in a wall, or defeating a certain number of enemies, but things still become monotonous despite these attempts to reduce the game's predictability. The developers tried to address this issue with another method by allowing you to change characters between rounds, but the awkward changes in the storyline are quite abrupt. This makes for an incoherent narrative that's both confusing and dull. In the end, not matter which path you take, you are have a choice between monotony and confusion, neither of which presents a satisfying alternative. Between the forced onslaught of pointless mini-games, a confusing storyline, and the awkward attempts to paper over these flaws, the game itself becomes an exercise in frustration and unrealized potential. As you get deeper into the game, you'll find yourself fighting against multiple foes at once, which presents more problems. It's difficult to focus your attacks on a single foe since there's no damage, and combating two or more characters simultaneously also means you'll need to spend a lot of time on defense and not enough on the attack. This allows the AI to get away with cheap attacks, which makes the gameplay frustrating. Marvel Nemesis' most impressive technical feature are the destructible and fully interactive environments. Unfortunately, these destructible arenas also create some of the game's biggest problems. Aesthetically, these are impressively rendered levels that lend the game an incredible amount of realism, giving it a dark urban feel. It's a shame that there aren't more of them, since they repeat too much as well. 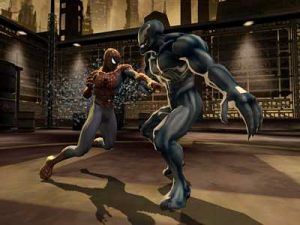 Likewise, the character animations are impressive, remaining faithful to their Marvel Comics heritage while allowing you to perform some truly spectacular moves with wild jumping attacks, and cinematic camera angles lending each battle a sense of dramatic tension. The voice-over acting is decent and effectively conveys the characters' personalities. Unfortunately, Marvel Nemesis' plot itself is full of holes and becomes rather ridiculous, thus irrelevant, early on. The production values are decent, but once you look below the surface, you'll find very little substance underneath the glossy exterior. Each fighting area features destructible elements that you can use in battle. You can use your controller to easily grab objects such as street lamps as weapons and even throw cars at your rival. This system is quite intuitive and allows the player to quickly get the hang of the controls and get right into the action. The game's environments also make effective weapons. Your character can throw an enemy through a wall that also increases the size of each arena. While this is technically impressive, it also hurts the play balance, since these attacks tend to inflict a great deal of damage on the receiving end. This represents another significant problem that makes the gameplay less enjoyable than it might have been. The superficial emphasis on objects makes Marvel Nemesis feel cheap and somewhat unbalanced, making the battles feel short and superficial. The poor implementation of its fighting system in the single player mode is what unhinges the game, making it an ultimately unsatisfying single-player experience that lacks the depth or nuance of other fighting titles. A major redeeming feature is the online mode, where you can challenge another player head-to-head without all the annoying character switches, illogical cinematic sequences, and annoying sub-missions that hurt the single player game. Here, the game's basic gameplay mechanics, excellent character design, and intuitive controls have a chance to shine unencumbered. Here, you can set up more interesting matches against human opponents who won't cheat, and you don't have to worry about awkward changes in location and character. Even though the single player mode suffers from serious flaws, the online mode is almost enough to salvage Marvel Nemesis. Comic book fans are the ones most likely to get the most enjoyment out of Marvel Nemesis. It's cool to control these characters and perform their special moves. You can probably overlook the convoluted plot, somewhat redundant level design, predictable mission objectives, and unbalanced fighting system if you are really into the game. The intuitive controls and interface makes the one-on-one battles quite exciting, but Marvel Nemesis falls flat in the single-player story mode, where you are set on a path that isn't quite as exciting as you'd hope it would be. Fighting the same characters repeatedly gets monotonous in a hurry, and this lack of variety is a major problem. The controls themselves are fine for simple battles, but don't work quite as seamlessly during more complex fights against multiple battles. Solo play isn't that great, but Marvel Nemesis' online mode, which is stripped down to the basics, is actually more enjoyable than the overly complex single player missions. Ultimately, while Marvel Nemesis: Rise of the Imperfects has some impressive elements, the entire package never comes together and the game falls short of it's potential.